It’s been a week since I went to Salt Lake Comic Con, but Friday the 13th seemed like the right time to post about it! This was the first comic con for Salt Lake and the first I’ve attended. I was only able to attend one day of the three, but Friday was a great day to be there! The top item on my agenda was an unofficial sneak peek at The Hobbit: The Desolation of Smaug. Immediately after I registered I got in line to wait for it. After some initial confusion about which line to stand in, I found the correct one and settled in for some people watching. This meant missing out on panels on Firefly (a show I have recently come to appreciate), Marvel vs. DC, and a Q&A with Q (John de Lancie’s character from Star Trek: the Next Generation), but I waited patiently – only to have the door closed in my face. I was seriously the next person in line when the room was declared full. First lesson of first comic con: don’t expect to stick to your outlined schedule. Upon being denied entry to my top choice, I found a suitable alternative in Peter Lyon, the master swordmaker for Weta Workshop. That was fascinating, and would come back into play later in the day. I had intended to go to a discussion of the changing publishing world next, but wound up in the ballroom for Ray Park’s spotlight session. Park, aka Darth Maul, Snake Eyes, and Toad, was truly entertaining! He talked about emulating Jackie Chan, Bruce Lee, and Charlie Chaplin, and he has the personality to go with the physical tools. He also has a Scottish accent, which explains why he didn’t supply the voice for Darth Maul. Park was only 21 when he was cast to play the villain (he always wanted to be a hero), and wasn’t sure he could pull off the integral intimidation until he saw the crew’s reaction to the first fight scene he filmed. He lobbied unsuccessfully for a different death in Phantom Menace (decapitation), but would relish the chance to reprise the role. Rather than the mech legs Darth Maul’s been grafted onto in the comics and cartoons, Park joked that he should have a hover board and use his double-bladed lightsaber like a kayak paddle! After taking questions and adulations from the audience, Park wrapped up the session by bringing young kids in costume up on the stage and teaching them some martial arts poses. He was terrific! I made my first foray into the vendor floor next. Lesson two: be prepared to spend plenty of time and money shopping the vendor floor. I didn’t make any purchases on my first pass. I wanted a look at everything that was available before I made my selection. I didn’t pay to have my picture taken with any of the celebrities, but I did take photos of a few from a distance. I managed to get pictures of David Prowse (Darth Vader) and Peter Mayhew (Chewbacca). I didn’t see Shatner or Stan Lee in person, but I did see William Kirchner (Bifur) and Manu Bennett (Azog) from the Hobbit films! 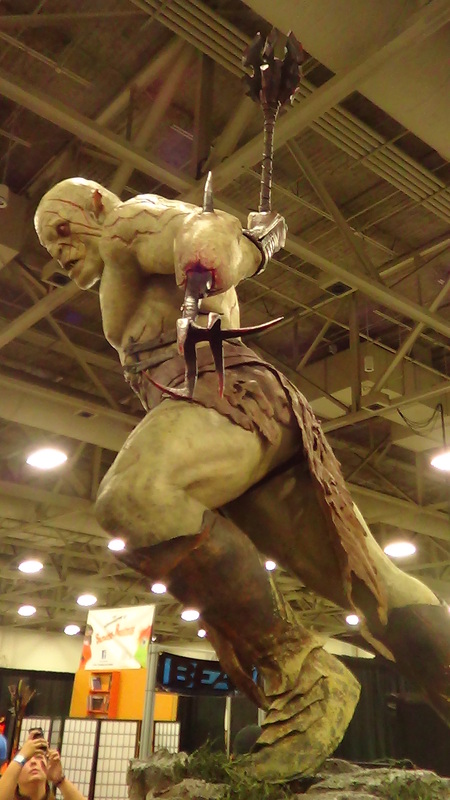 I took more photos of the life-sized Azog statue on display at the Weta booth than anything else at the con. The whole booth was spectacular. I particularly enjoyed seeing Peter Lyon take the sword Orcrist from a display case and show it to a few lucky fans. That was a serendipitous con moment! I was sorely tempted to get a treasure at the Weta booth, but the answer to the question “What have I got in my pocket?” was not enough for even the smallest knife. There were some desirable items in my price range, but I decided to give it more thought during the next panel. Unfortunately I showed up too late, and both of the writing panels were already full. So I got in line with friends for the next popular panel on my list, Avengers vs. X-Men. That panel proved too popular for the likes of those of us waiting in the general line, so I went to listen to Brandon Mull and Chad Morris talk about comedy in writing. They were in a comedy group in college, and performed some funny sketches and songs. They both signed books at a booth following the panel, so I went back to the vendor floor and waited in a line that already wrapped around the booth. Lesson three: be ready to wait in line. I read my advance reader copy of She Walks in Darkness while people paraded by in costumes. The book I asked Mull to sign was also an advance reader copy – Spirit Animals: Wild Born came out this week. It’s a series with an online game component in the same vein as 39 Clues; Mull laid out the full series and wrote the first book (of seven). Getting the book signed took most of the hour set aside for a second pass of the vendor booths, so I stepped out for one more panel. 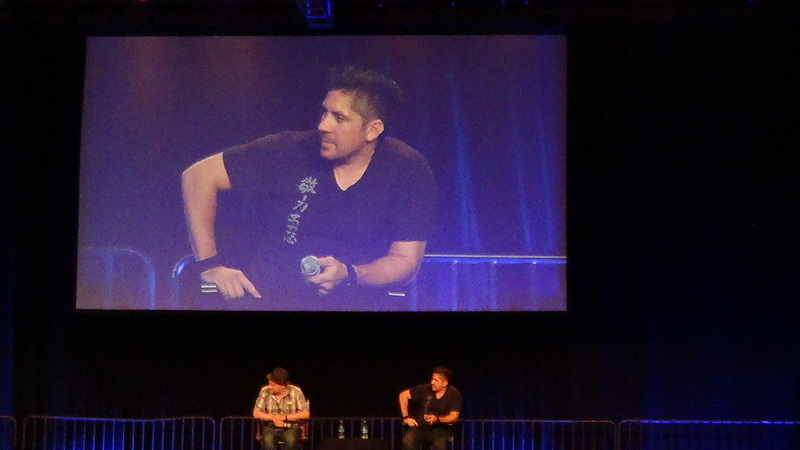 An Examination of the Hero’s Journey was the only panel on my original schedule that I was able to attend. I was familiar with one of the authors on the panel, having once sat next to him at a signing – that was Dave Farland. The other members were Rhiannon Paille, Brad R. Torgersen, and Bryan Young. Robison Wells did not appear as scheduled, but having heard him discuss his social anxiety on the Writing Excuses podcast, that was understandable. I asked the panel how they address the matter of romantic interest in their writing, given that the examples being cited – Greek myth, Arthurian legend, Lord of the Rings, and Star Wars – present only two options for the hero: love ’em and leave ’em or monasticism. The responses from Farland and Paille were noteworthy. By that time I had come to the conclusion to make a worthy purchase from Artist’s Alley. Lesson four: support the artists who come to the con. I wanted something unique, something I may not be able to buy at a local store or order online. When I returned to the vendor floor the closing announcements started and the lights dimmed. I hurried back to a booth that arrested me on my first pass, hoping the artist and a particular print would still be there. They were, so I bought an X-Men/Star Trek (NeX-Gen) mash up picture from Stewart Craig. Later I located his blog and was stoked to read that it was one of three images he created specifically for Salt Lake Comic Con. It made an ideal souvenir! I continued to walk the vendor floor, now emptier and darker, and took more photos of the booths I hadn’t seen on the first pass. I wasn’t coming back on Saturday (when the crowd ran between 70,000 – 80,000 con-goers), so I had to make the most of my opportunity that night. I found the Lego booth, one I would not have wanted to miss, among others. 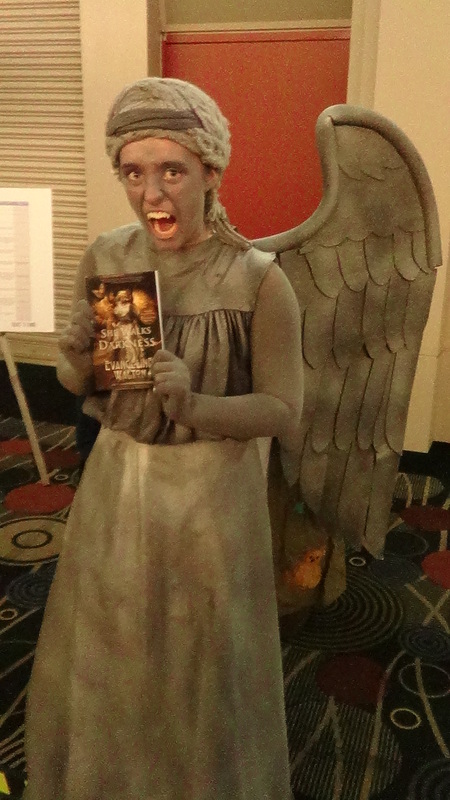 I returned home a reaffirmed geek, with photos of acceptable role playing role models for my kids and this great shot of a weeping angel posing with my copy of She Walks in Darkness!